Meanwhile, the British Ministry of Defence has said that more damning evidence could lead to further prosecutions in other Iraqi abuse cases. 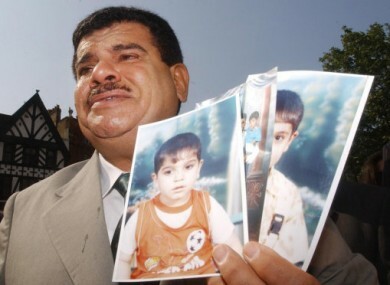 File photo from 2004 of Daoud Mousa, the father of Baha Mousa who was killed while in the custody of British soldiers. BRITISH SOLDIERS HANDCUFFED, hooded and held Baha Mousa in stress positions before his death in Iraq in 2003, an independent inquiry has found. Publishing his report, Judge William Gage said that British soldiers kept the hotel worker in these stress positions in “extreme heat and conditions of some squalor” before he died in a state of exhaustion and fear. The inquiry reported its findings into the death of Mousa, an Iraqi citizen who died while in detention at a military facility in Basra in September 2003, yesterday following a year-long probe. The 26-year-old was subjected to assaults by multiple guards but Gage singled out Corporal Donald Payne for his part in the violence against Mousa. According to the damning report, Payne – who was actually in charge of supervising the welfare of those in custody – instigated and orchestrated the assaults. The retired judge said that Mousa, who obtained 93 separate injuries before his death, was also assaulted from “time to time by others who happened to be passing by”. A method known as the “choir” was used on Mousa. That consists of punching or kicking each of the nine detainees in sequence so they each emit a different sound. A noisy and hot generator was also used to torture the youngest detainee while he was being questioned. In Mousa’s final moment, Judge Gage said he believes he was punched, kicked and thrown across the room by Payne. Before this happened, he had been made vulnerable by a lack of food and water, the heat, acute renal failure and exhaustion, the inquiry found. Hooding, being kept in stress positions and restrained in plastic handcuffs – forms of torture used by the British soldiers on Mousa – also contributed to his death, said the inquiry. Although Payne was singled out, the report found that not all the soldiers involved in the assaults on detainees could be identified. Lieutenant Colonel Jorge Mendonca was acquitted of knowledge of the beatings being carried out in the 36 hours leading up to the death of Baha Mousa. As commanding officer, he ought to have known what was going on in that building long before Baha Mousa died. I find further that although he knew conditioning was taking place he ought to have found out precisely what conditioning involved and appreciated the dangers of allowing detainees to be hooded and placed in stress conditions. Despite the damning report, which singled out individual officers and men, Judge Gage said that the violent incidents surrounding Mousa’s death did not amount to an “entrenched culture of violence” in the battlegroup. In 2005, Payne was charged with manslaughter and war crimes and served a year in prison. He was also discharged from the army. The Guardian today reports that a number of soldiers have been suspended following the publication of Gage’s report. Meanwhile, the Ministry of Defence has said that more inquiries are revealing new evidence of “some concern” in other Iraqi abuse cases. There could be more prosecutions, said defence secretary Liam Fox. Head of the Army, General Sir Peter Wall confirmed Fox’s comments and said the inquiry had cast a “dark shadow” over the British service. There is no place in our armed forces for the mistreatment of detainees and there is no place for a perverted sense of loyalty that turns a blind eye to wrongdoing or erects a wall of silence to cover it up. Fourteen of those referred to in the Gage report are still in the army, Wall told The Guardian. The Ministry of Defence has paid out £2.83m in compensation to Mousa’s family and other men who were detained between September 14-16, 2003. A still taken from video of a British soldier screaming abuse at hooded Iraqi detainees which was played to the public inquiry into the death of one of the prisoners, hotel receptionist Baha Mousa in 2003. Another still from the video played at the inquiry shows the detainees handcuffed using so-called plasticuffs. This pictures shows the severe beating suffered by Iraqi civilian Baha Mousa who died in UK custody. The inquiry heard he had 93 separate external injuries. Baha Mousa, his wife and two children. Email “British army suspends more soldiers following Baha Mousa inquiry”. Feedback on “British army suspends more soldiers following Baha Mousa inquiry”.